Directory of Archives is an update-able comprehensive list of Archives & Collections that reference, include South Asian history. 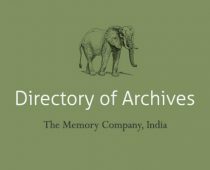 It is run by The Memory Company, founder of the Indian Memory Project. The Memory Company does not claim any rights to any of the images displayed here. I am looking for the email of some historians, specialist of the Commerce and piracy between Surate and Red sea from 1700 till 1730.